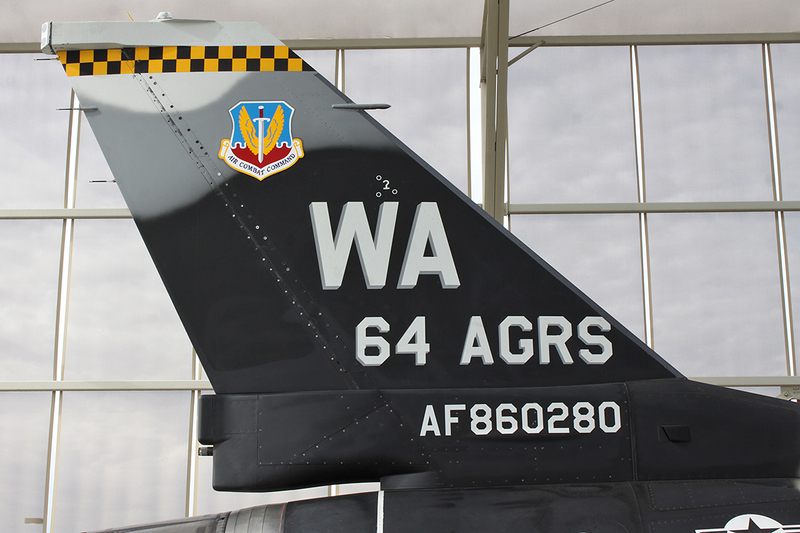 The 64th Aggressor Squadron is know as the 64 AGRS with a WA tail code. 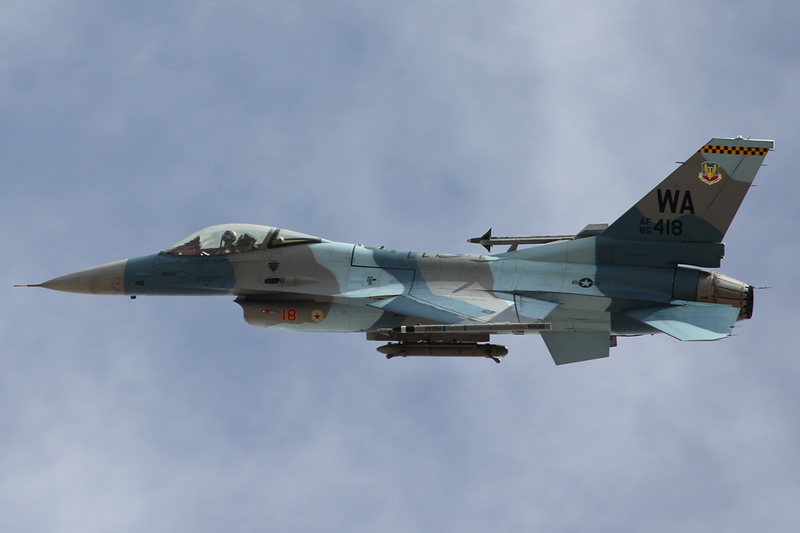 The 64th Aggressor Squadron (64 AGRS) have been providing dissimilar air combat training for over 40 years. Alan Kenny/Speedbird visited the squadron in November 2013. The Aggressor programme started with the activation of the 64th Aggressor Squadron in 1972. The programme was introduced as a direct result of high air combat loss rates during the Vietnam War. 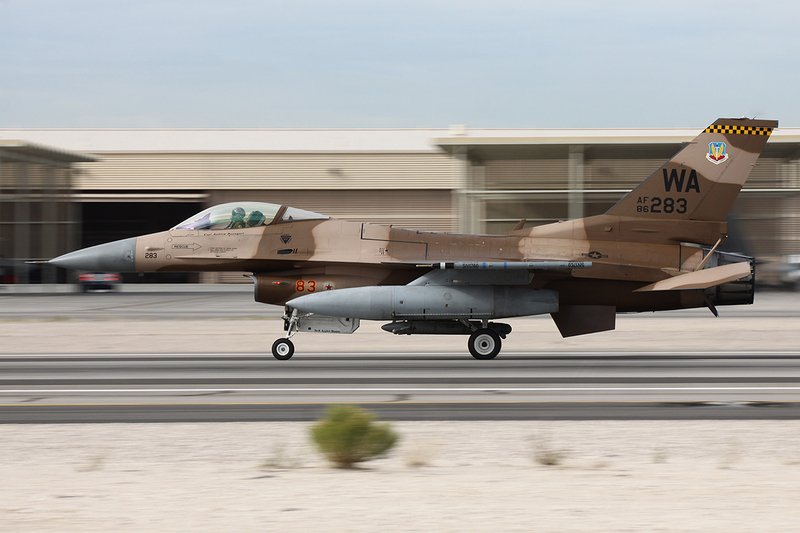 The was a drastic need for training by a dedicated adversary force providing dissimilar air combat training. The programme replaced pilots flying the same type in mock combat at their home base with pilots and controllers trained in Soviet and other potential adversaries tactics. 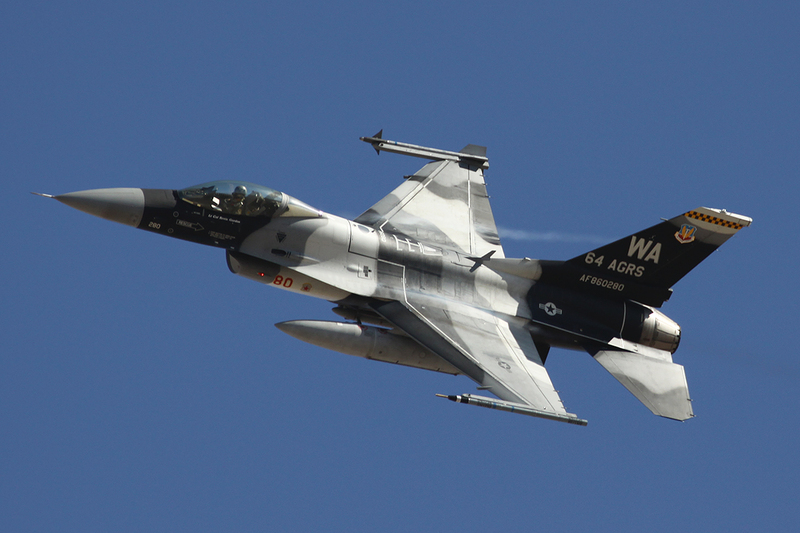 The squadron has seen many types used which are similar to adversary aircraft, such as the MiG-19 and MiG-23. 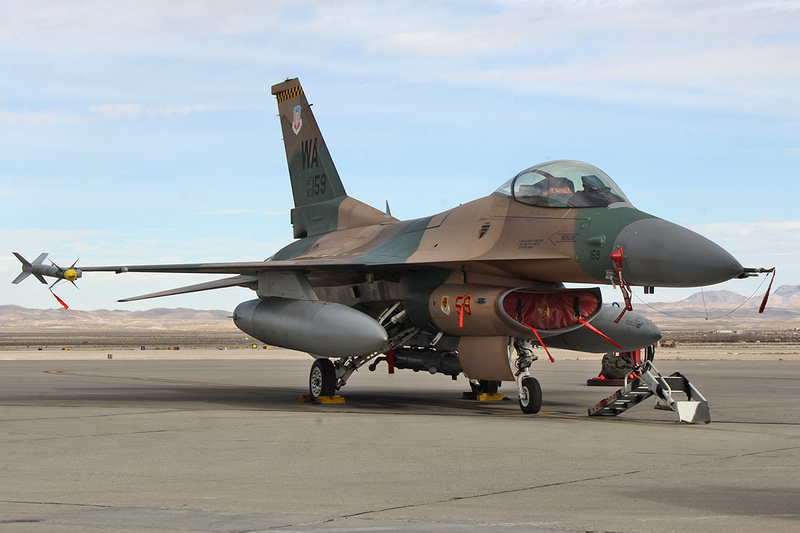 Captain Scott ‘Cheetah ‘Petz is an F-16C aggressor pilot and flies jet 84-1236 and Captain Nicholas ‘Smack’ Vogel is an Air Battle Manager based on the ground at Nellis Air Force Base. Describe your day-to-day job, what is your role within the air force and do you ever deploy or train with other units? My day-to-day job as an aggressor pilot is to replicate and teach adversary tactics. Day-to-day, administrative wise, make sure we are scheduled to fly certain model lines per week in order to train local and visiting units. 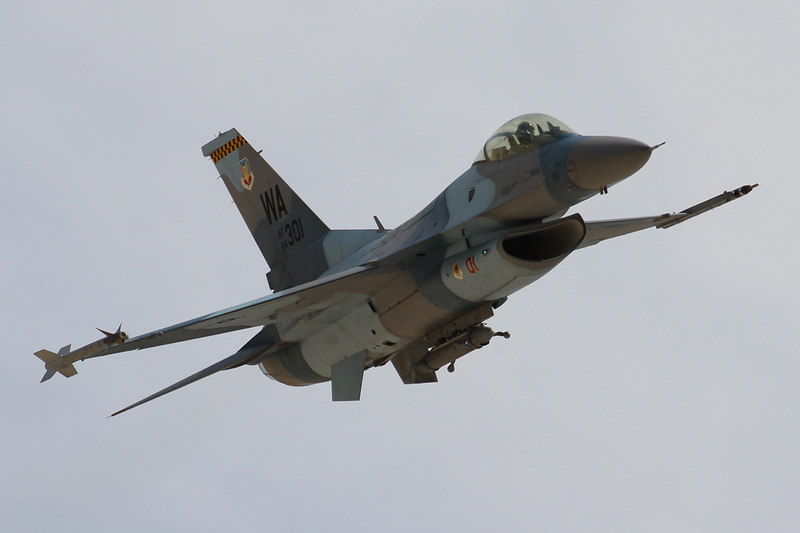 We want to make sure that we are currently qualified in our airframes, but we are also currently qualified on representative threat tactics and aircraft. I want to make sure I’m ready to go and fly my jet and then also train and instruct them with countries and US personnel. 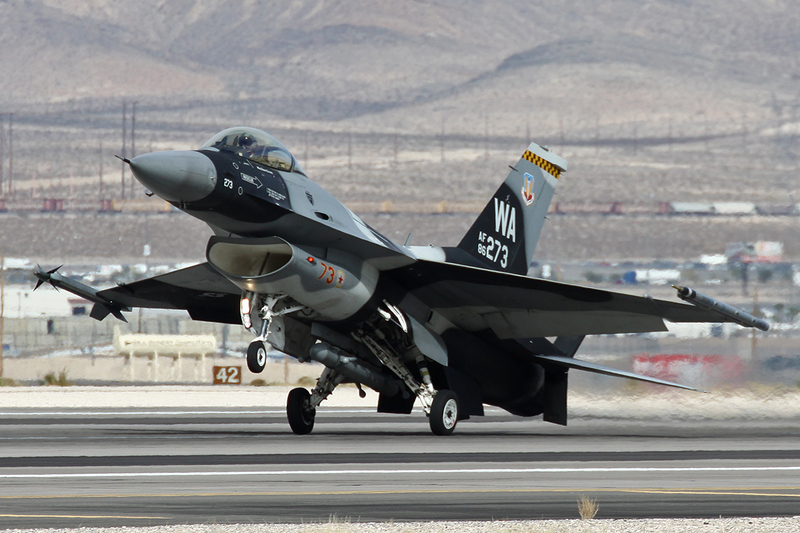 My primary job in the Air Force is an Air Battle Manager on the E-3 AWACS, but while stationed here with the Aggressors I perform similar responsibilities from the ground, using the ground based radars and radios throughout the Nellis Range. This is better known as Ground Control Intercept, or GCI, though GCI in the Aggressors are simply referred to as: Baron. 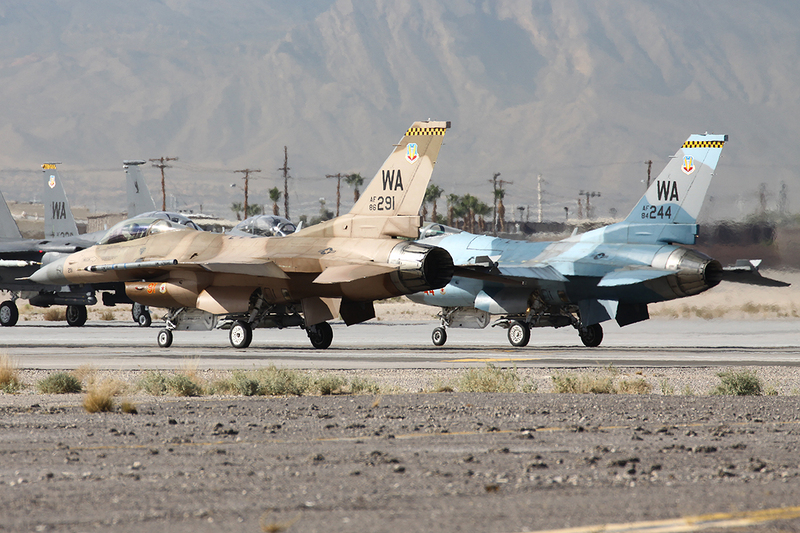 My role within the 64th Aggressor Squadron is to execute the tactical plan as briefed by the Mission Commander. To do so effectively we study threat country GCI and replicate their form of GCI as best we can, directing every aircraft movement from committing fighters, pre-planned tactical executions, defensive reactions, targeting, and even helping the pilot achieve a visual status (or tally) of bandits, so they can fight their best BFM (Basic Fighting Manoeuvres, or more commonly, dogfighting). For the most part, every action taken by a Red aircraft (aggressor) goes through me, as we attempt to identify and exploit weaknesses in Blue Air’s (friendly forces) gameplan. While doing this I also assist with aircraft deconfliction (geographic or altitude) to ensure we are being safe at all times. This is a very important part of my job and it should go without saying that I take it very seriously. 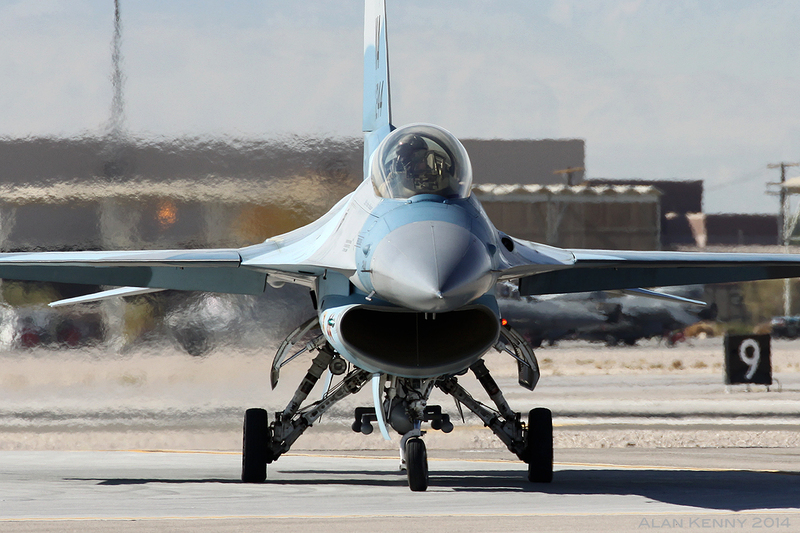 There’s absolutely no reason to ever lose an aircraft or pilot during a training mission. Cheetah, how much of your role is simulator based on the ground? It depends. If we can fly, we’ll fly, but we still have a requirement to do so many simulators a month. If we’re not flying, due to whatever reasons, they will prioritise getting you in a simulator as much as possible. How long is the tour on the squadron? It’s two and a half to three years. For me, I’m a full time reservist so I could be here as long as they need me. It could be three years, I could be here another six or seven months. 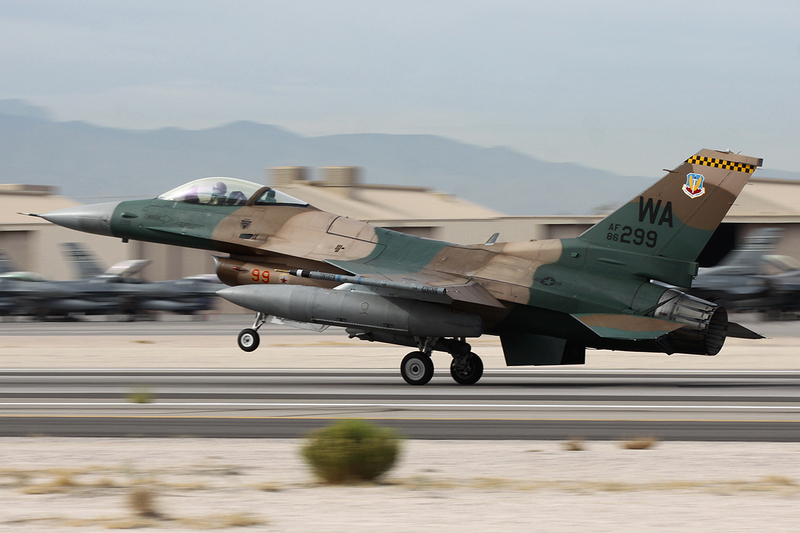 What training do you undergo to become aggressor pilots? We have an aggressor syllabus. When we used to do eight or nine Red Flags a year it involved quite a bit of Red Flag flying, where you could reach the pinnacle of being a Mig-1. Now we only have two or three Red Flags a year so to reach the point of being a MiG-1 or a baron, you have to see so many Red Flags, you have to see so many large force employments and you have to do night employments. There’s a specific syllabus that we have to follow in order to achieve wingman status, flight lead and then eventually MiG-1 status. And there’s an experience level you have to have in the blue world before they’ll even consider bringing you in as an aggressor. Do you have to be top of the class to get in here? No, not any more. It used to be like that. You used to have to be nominated, then you had to be just an instructor pilot, now you don’t even have to be an instructor pilot. You do still have to be fairly highly recommended. So you don’t get chosen, you can apply for it? I can image you don’t want someone coming in who’s not going to get on with everyone else? It is important to get along with one another because we’re going to be here two and a half years, but that’s no different to any other squadron. The big difference is, if you look at the aggressors the same as you do a regular unit, a regular unit sticks primarily to themselves. They work amongst one another and then every now and then they’ll go out and do a deployment working with other units. 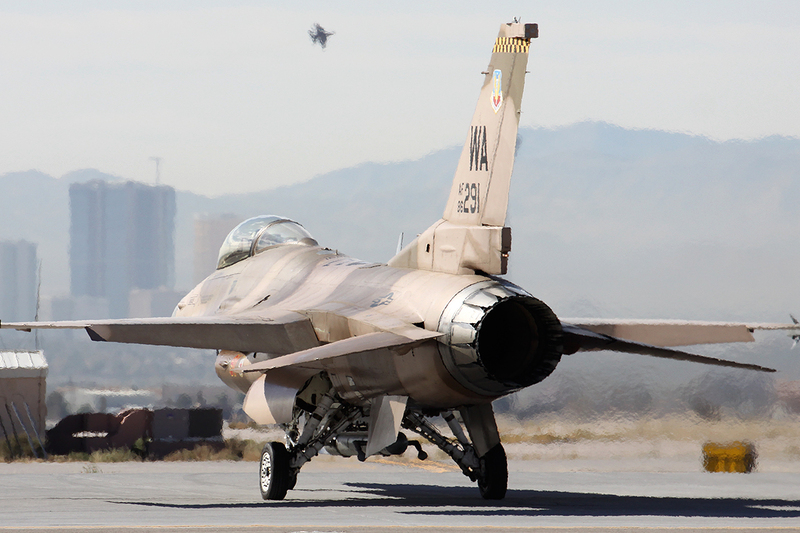 When you get 5,000 people that come in for a Red Flag, you’re going to be standing up in front of those people, you’re going to be a representative of the aggressors. So you’re going to stand there and talk to people and you need to be knowledgeable. You’re going to look at the guy and tell him how you flew your jet today and give him some instructional pointers. So you need to be credible and knowledgeable, not only as a pilot but as a professional. We have to be like that so we have a little more clout and they understand and trust what we’re saying to be true. With the shift towards the Pacific, are you learning the tactics from the Pacific forces, i.e. China and India? 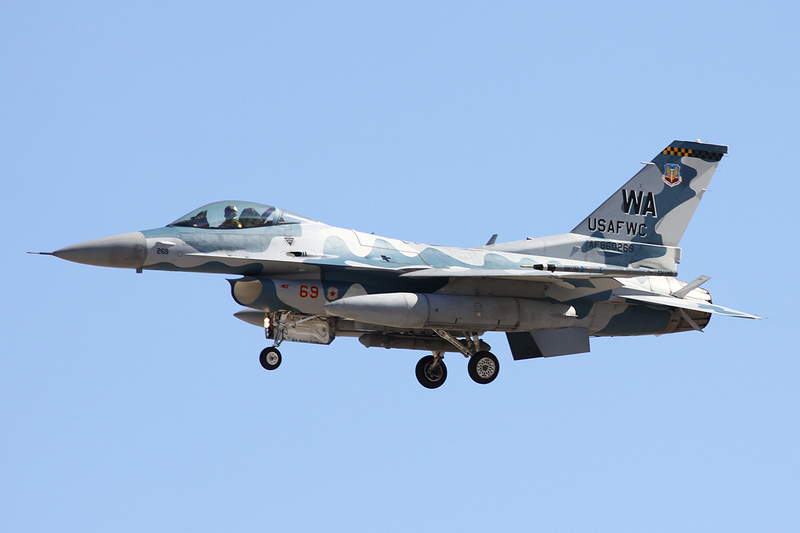 If we talk about blue aircraft, the tactics are developed around the capabilities of the aircraft so the same thing goes for any other threat aircraft or the country that owns certain aircraft. Say we were talking about the MiG-29, we take all the knowledge we know about the MiG-29 and we use the worst case scenario and build it into the programme. We use that kind of a tactic to fly against blue forces so they can see the best that this airplane has to offer. 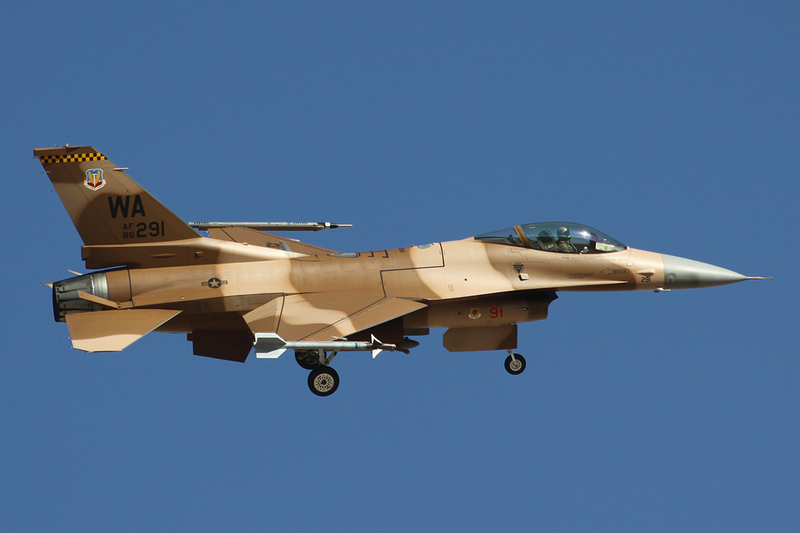 Do you ever try replicating the capabilities of MiGs or Sukhois with the F-16? The big issue with the MiG-29, for example, that jet holds roughly the same amount of fuel as my F-16 but it has twin engines. Which means it’s got twice the burn rate. So if I really want to replicate that aircraft correctly then I have to simulate how much fuel that aircraft would have. He would take off from his airfield, he would fly for three or four minutes and he’d be about out of fuel so he would have to land pretty quickly. Now for training purposes we’re not going to do that with Red Flag because it would affect a lot of the training, but that’s something to consider when you talk about replicating different aircraft. Alan Kenny is one of the former AirForces Monthly Facebook page content creators. He now runs and maintains this page. All images and content are his copyright. Hi,I check your blog named “It’s all about Aggression – The Tactical Air Network” daily.Your story-telling style is witty, keep doing what you’re doing! And you can look our website about دورات راديو.